This adventure is now fully booked. Click the BOOK NOW button below to join our waiting list and you will be notified if a place becomes available. Hold on tight for this full-on five-day adventure, with plenty of mushing and only three days off work! 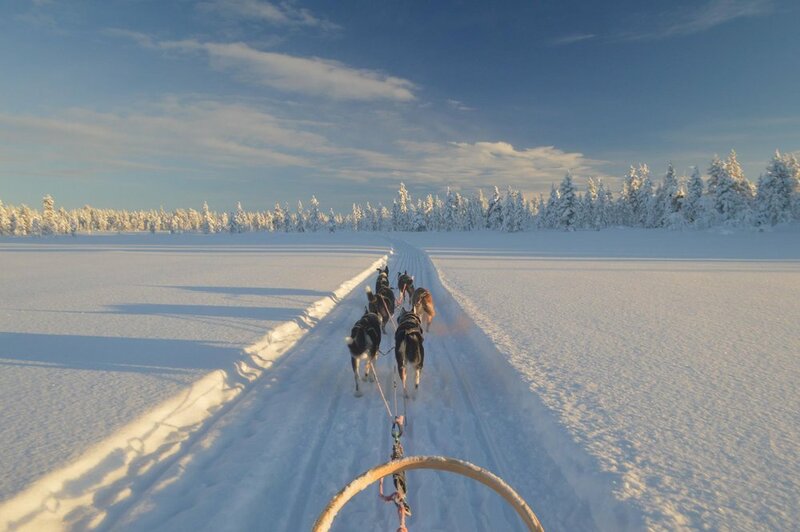 This trip is short but intense - not only will you get a three-day wilderness safari with your own sled dog team but from the first evening you can learn all about the dogs’ routines and get hands-on behind the scenes of the farm. By the end of this unforgettable trip you’ll have formed a special bond with your dogs and learned to be a confident musher! Due to the nature of the safari there are only 8 spaces – don’t miss out on this! You'll arrive at Kittila airport and be transferred to the farm via minibus, with a chance to have coffee and snacks on the way. After arriving at the farm, your host will greet you and give you all the kit and clothing you will need, talk to you about keeping safe and warm in the Arctic and then introduce you to the farm and dogs. There will be a briefing the next morning about the safari itself where all your questions will be answered. That night everyone will be staying in a farm ‘kota’ and all of your bags will go down with you. The kota is a traditional circular log building with a central fireplace over which we will cook the evening meals for the first two nights. If you want to get involved in feeding the dogs on the first night (between 5 - 8pm) you can shadow a mentor during the feeding session, or you can just hang out by the fire in the kota whilst waiting for dinner. Please note if you do help with feeding the dogs your own dinner will be a bit later so you might want to have snacks handy, but the experience is worthwhile! There is also an option to go snowmobiling on your arrival evening (not included in the trip price, you can add it to your booking below). You’ll have some time to chat through the highlights of the trip and provide some feedback before you’re dropped off at your hotel in Hetta – where you can hang out together and have a well-deserved meal and enjoy a hot sauna experience. Our recommended routes are from Bristol to Helsinki (non-direct) or London to Helsinki (direct), and then from Helsinki to Kittila. Please make sure you know your connecting times in between flights and have adequate insurance cover for delays or cancellations. The airport transfers will be arranged at a time to suit the majority of arrival/departure times, so we would recommend you try and book flights arriving in the early evening on Thursday 21st and leaving at lunchtime on Monday 25th. Please note the transfer to the farm takes around 2.5 hours. As soon as you’ve booked please email Rowan (rowan@explorersconnect.com) with all of your flight details so she can finalise transfer times on the arrival and departure days. This holiday runs from Thursday 21st to Monday 25th March, 2019. There are ONLY 8 SPACES available! If the trip is full, this button will take you to join the waiting list.